What would you do if someone you lost-- returned from the dead... Chip and Lyn are a very happy couple and deeply in love. As they talk on the phone one morning, Chip encounters a trespasser while preparing his semi for work, and is murdered. He finds himself in the Afterlife, unable to be seen or heard by the living.Needing his fianc to know he's still alive, Chip quickly learns to grab her attention with after-death communications (ADC's). While sharing his new life, divine love, and spectacular adventures, he takes Lyn to visit another world... the Afterlife. "I have never witnessed a closer relationship between two people in two separate dimensions. If you wonder if life goes on after we die, you will be convinced that it does after reading this book." Leslie Dutton, Psychic Medium "Love is a bond that survives even unthinkable tragedy. This story demonstrates how love is the bridge that supports and connects us to those departed." Robert Sharpe, Author of Joy Potential: Where You'd Least Expect It "If you've ever wondered if the Soul continues on after the physical body ceases, wonder no more." Michelle Griffin, Through The Veil Productions As the psychic mediums in this book point out, Chip is a perfect model for "proof of life" in the Afterworld. The evidence of his survival gives the reader hope that eternal love and ever lasting life do exist.Filled with grief, humor, and otherworldly love, We Need To Talk will make you question the nature of life after physical death. We Need to Talk: Living with the Afterlife by Ragan, Lyn was published by Amazon Difital Services LLC - Kdp Print Us in March 2014. 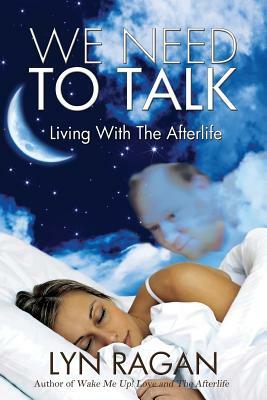 The ISBN for We Need to Talk: Living with the Afterlife is 9780615980829. Be the first to review We Need to Talk: Living with the Afterlife! Got a question? No problem! Just click here to ask us about We Need to Talk: Living with the Afterlife.